A balanced nutrition plan is essential for providing our bodies with the nutrients required to make them function properly. Unfortunately, today's busy, modern lifestyles mean we don't always make healthy food and drink choices - so we often miss out on necessary nutrients. Processed food has often lost essential vitamins, minerals and other nutrients, so, it is very important that we adopt good eating habits and use supplements when necessary. As the villi in your intestines become damaged due to lifestyle factors, it becomes increasingly difficult for your body to absorb nutrients. No matter how good your nutrition, if you aren’t absorbing the nutrients – It’s just a waste! The Herbalife range of quality products aims to provide the elements every body needs daily to maintain optimum health. Herbalife maximises this "intelligent nutrition" through unique formulations and select, high-quality ingredients. An intelligent nutrition plan should provide bodies with balanced levels of energy, vitamins, minerals, good carbohydrates, plant-based protein, healthy fats and beneficial fibre, herbs and antioxidants. The intelligent nutrition concept involves eating a variety of foods - but all in moderation: being "intelligent" about what we are eating. Cereals for breakfast, sandwiches for lunch, pasta for dinner and rice cakes, chocolate and biscuits for snacks?! "My diet had been almost all carbs i had no nutrition going into my body"
The way we personalise programmes to address individual needs is something Herbalife is extremely proud of. These personalised programmes focus on striving for complete nutrition. 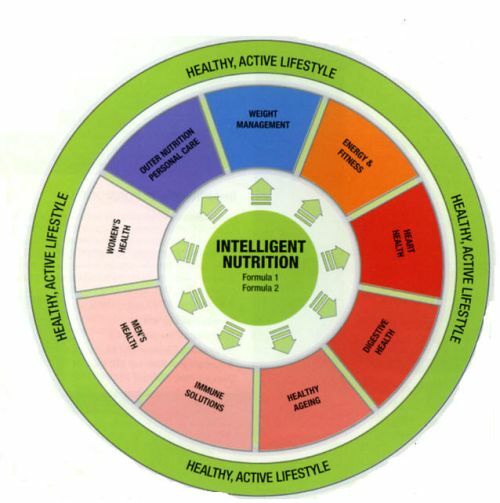 The "intelligent nutrition wheel" shows you how Herbalife programmes fit perfectly within a healthy, active lifestyle. At the centre of the wheel are Herbalife core products: Formula 1 Heatlhy Meal and Nutritional Shake Mix and Formula 2 Multivitamin Complex. These core products are at the foundation of each of our programmes to guarantee balanced nutrition. The wheel shows that just outside off the core range range of products sit the Targeted Nutrition Product ranges which build on the foundation of balanced nutrition, personalise your program by selecting a product range to suit your specific individual needs.